No matter how much you take care of your skin throughout the day, pampering it at night is essential to get a fresh and rejuvenated look. When you are asleep, your system works overtime to rejuvenate the skin cells and repair all the damages caused to it. Hence, using a good night cream every day is a must for us. And what if it comes with skin whitening agents? Well, nothing can be better than such a two-in-one product that gives a brighter, softer and fairer skin after each sleep. In this article, we have listed 7 best whitening night creams available in India. Our skin does ‘heavy lifting’ (repairing, restoring, and regenerating) while we sleep during the nighttime. A night cream offers a rich, thick, and heavy composition featuring the most powerful hydrating as well as anti-aging compounds, which primarily focus on moisturization and recovery. Hence, using it regularly can give you a refreshed, and rejuvenated appearance. Why Use A Whitening Night ream? While a night cream is critical to repair and rejuvenate our skin overnight, a whitening night cream improves its tone and brightens up the complexion at the same time in order to add glowing fairness to the already refreshed look. Many creams, these days, offer skin whitening properties, which can be used as alternatives to expensive fairness products or treatments. 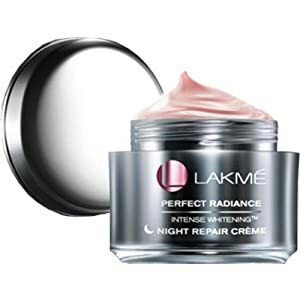 Lakme Perfect Radiance Intense Whitening Night Repair Cream is formulated with Vitamin B3 and precious micro-crystals, which help you get a flawless skin through nightly rejuvenation. It treats all the blemishes and dark spots effectively while giving your skin a lighter tone and more elasticity. It also provides enough moisture to the skin and reduces the secretion of excess oil, thereby making it look radiant glowing. Price: Rs. 360 for 50 gm. The Olay Natural White All In One Fairness Night Cream contains triple vitamins – pro vitamin B3, B5, and vitamin E, which gives a healthy-looking skin that glows from within. The rich, luscious formula gives all in one fairness by reducing dark spots, melanin transfer, and dullness from the skin. It keeps the skin clear and well-moisturized while the regular use of it lightens the complexion to reveal a fairer and younger looking skin. Price: Rs. 350 for 50 gm. The L’Oreal Paris Dermo-Expertise Pearl Perfect Night Cream contains tourmaline gemstone, which improves microcirculation in the skin and gives it an intense rosy glow. Its anti-melanin agents turn your skin fairer and more radiant over time. The vitamin E in the night cream also fights against the free radicals all night to rejuvenate your skin and make it look younger. 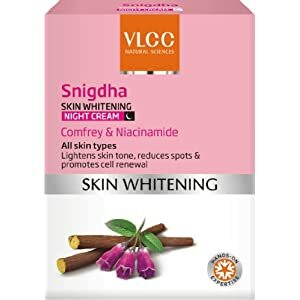 The VLCC Snigdha Skin Whitening Night Cream is a comfrey and niacinamide-rich product that is suitable for all skin types. It contains licorice, turmeric, wild mulberry, and lemon peel extracts, which cumulatively help control the production of melanin in our skin and reduce dark spots. The ingredients also help in reversing the damages caused by exposure to the sun and pollutants while promoting cell renewal significantly. Price: Rs. 250 for 50 gm. 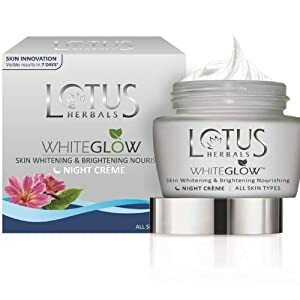 The Lotus Herbals Whiteglow Night Cream is a skin whitening and brightening product with superb nourishing properties. It has milk enzymes, mulberry, grape seed, and green tea extracts, which work together to reduce uneven pigmentation, eradicate dark spots, enhance the radiance of the skin, and give the skin visible fairness in just one week. Price: Rs. 410 for 60 gm. 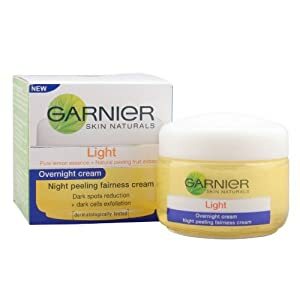 The Garnier Skin Naturals White Complete Night Cream is a multi-action fairness cream that contains vitamin C (pure lemon essence) for enhancing the complexion and the elasticity of the skin. It has natural peeling fruit extracts, which deeply exfoliate the skin to remove dark cells. The melting texture of the product also helps in moisturizing and nourishing the skin overnight, leaving it smooth with a satin finish. Price: Rs. 195 for 40 gm. 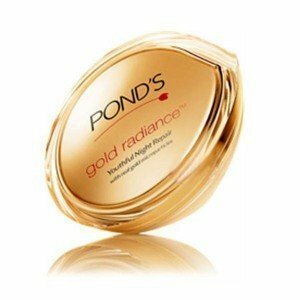 The Pond’s Gold Radiance Youthful Night Repair Cream contains real gold microparticles, which help in both reducing the existing dullness of your skin and recapturing its natural glow while you sleep. The Vitamin B3 and CLA in the cream repair the skin by reducing fine lines, wrinkles, etc. and revitalizes it to combat aging. Regular usage of the product certainly gives a fairer and younger looking skin. Price: Rs. 899 for 50 ml. Some products with skin whitening poperties contain topical steroids, which mess with the natural steroids of our body, trigger the blood sugar levels, and lead to hypertension. So, long-term use of such whitening creams can damage our health. Mix pure virgin olive oil and coconut oil in equal amounts and add the content of a fish oil capsule to prepare a creamy concoction. Take 1 tablespoon of melted virgin coconut oil and add 1 teaspoon of fresh rose water to it. Collect fresh cocoa butter and add an oil of your choice (coconut oil or olive oil or almond oil) to it. Brew some green tea and blend 1 teaspoon of almond oil, (1/2) teaspoon of coconut oil, and a dash of freshly squeezed lemon juice with it. Scoop the transparent gel out of a fresh aloe vera leaf and combine a few drops of lavender essential oil with it. Hope these recipes help you get softer and brighter skin overnight naturally.